The Revival of William Morris Decorative Arts. In 1861, William Morris, an English artist, philosopher, political theorist, founded a decorative arts firm together with Burne-Jones, Rossetti, and others: the Morris, Marshall, Faulkner & Co. which provided beautiful, hand-crafted products and furnishings for the home. Later in 1875, he got total control over the company, which than was renamed Morris & Co. William Morris, was often seen as a part of Art Nouveau, he was not part of, he was one who influenced later the Art Nouveau. He made a major contribution to the revival of traditional British textile. Items in a range of crafts were designed, many were towards furniture: tapestries; more than 600 designs for wallpaper, textiles, embroideries, furniture, and stained glass windows. It became highly fashionable among Britain's upper and middle classes. This new design influenced interior decoration throughout the Victorian period. The idea that the design and the production of an item should not be divorced from one another, and that, where possible, those creating items should be done by a designer-crafstman, designing and manufacturing their goods. Morris revived a number of dead techniques in the field of textile industry. Of significant importance was the use of good quality raw material, natural dyes, and hand processing. He was always studying first the techniques of production prior to producing a new design. The design and production was influenced by the Gothic revival and the inclusion of medieval styles, using bold forms and strong colours. There was a tendecy to use patterns inspired by British flora and fauna. He was one of the most outstanding and influential designers of the Arts & Crafts Movement, and through his company Morris & Co, he produced some of the most fashionable textiles and wallpapers of his era. By the end of the 19th century Arts & Crafts had influenced architecture, painting, graphics, photography, decorative arts, weaving and much more applied arts. In the 1920's, sales were going down and there was a lack of available ressources. With no new designers entering the workforce, they reproduced what they already had. At the onset of the Second World War there was a reduction of skilled labour force. This brought on further pessimism about the future and in 1940 Morris & Co was bought by Sanderson. In the 60's Arts & Crafts became again an important influencer for design. 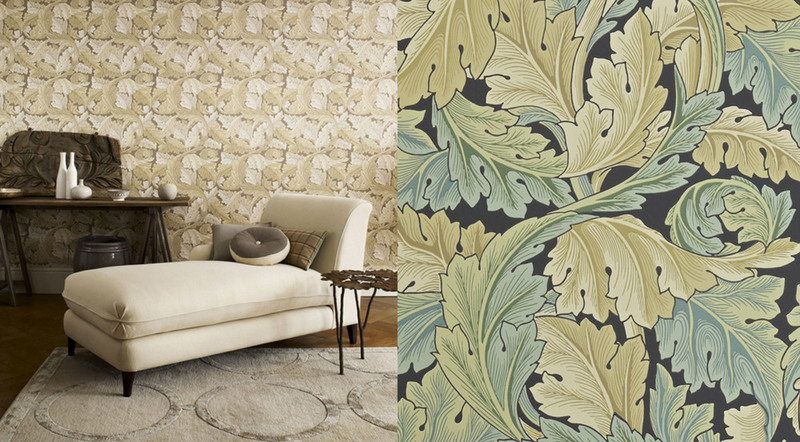 Sanderson began block printing Morris wallpapers which were re-coloured by the studio in psychedelic hues. They also decided to launch a new range of screen-printed fabrics, in tandem with the wallpapers. In the 70's the sales of printed fabrics became stronger than the wallpapers, in the 80s the demand for wallpapers was slowing even more. The block-print designs were transferred onto surface rollers, and by slowing the rollers down they achieved a good quality and a competitively priced machine printed wallpaper with the appearance of a block-print. Morris & Co celebrated his 150th anniversary in 2011 with a new collection of archive based prints, weaves, embroideries, and surface-printed wallpapers. William Morris was fascinated by medieval art, flora and fauna. He finds his inspiration in the English gardens, combines colours from nature with more stronger colours from the medieval. Fabrics designed more than 100 years ago can still be very trendy, used in a mono coloured setting. Or more subtle harmonies, feminine, poetic. Maybe you can't imagine to have a wall with Morris' wallpaper, but a touch in the bedroom or living room with some of his beautiful printed cushions? Pastel tones in spring can be easily changed in autumn with some darker colours. Strawberry Thief printed on cushions and much more. Some natural beige and brown tones will bring the pastel colours in a balance, not to make it to feminine. Nature, medieval inspiration, they will give a distinctive look to your room. Timeless, relaxing, refined. Digital printed wallpaper, inspired on a tapestry Morris designed. 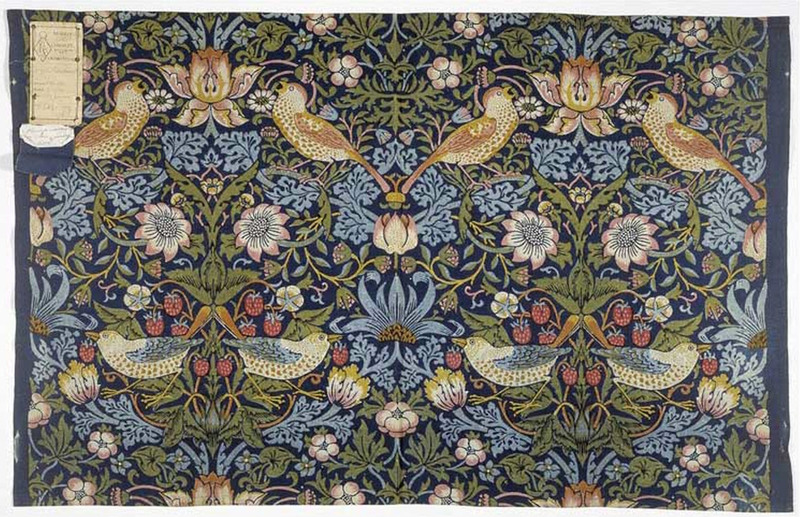 William Morris keeps inspiring, for interior, for fashion. Next week I'll show you how he inspired me to make some mood boards. Using his colour harmonies,his wallpapers and fabrics. Combining some beautiful furniture pieces executed in natural materials, interesting details or with innovative design.